Hollywood icons don’t get much bigger than Marilyn Monroe. The blonde bombshell wowed audiences in comedy films like “Gentlemen Prefer Blondes” and “The Seven Year Itch,” with her works eventually going on to gross $200 million at the box office. Although she passed away young, Monroe made the most of her years on this earth, including several high profile relationships. One of the most significant of these was her brief marriage to the baseball player, Joe DiMaggio. Although they weren’t married for long, the pair had a luxurious suite in New York together that is now open to the public. If you’ve always wanted to live like the starlet, now’s your chance. The suite is located in the Lexington Hotel in New York. It’s not far from the East River, as well as iconic monuments like the Chrysler building and Rockefeller center. 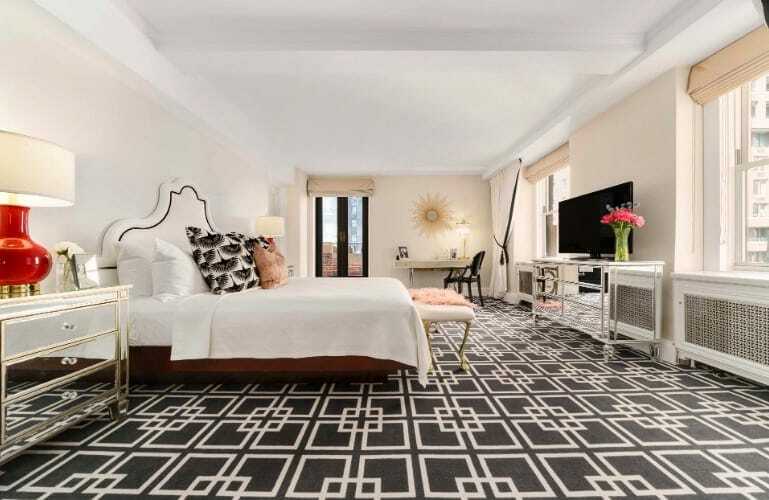 The hotel is also little more than a 20-minute walk from Central Park, so if you’re looking to get a feel for New York, this isn’t a bad place to stay. Plus, one of Marilyn’s most iconic cinematic moments happened just a few blocks away. If you’ve always wanted to see the subway grate where her skirt flew up in “The Seven Year Itch,” you’ll find it on 51st Street and Lexington Avenue. In the years since Monroe and Dimaggio called it home, the suite has been remodeled to give off a more contemporary feel. However, there’s a reason it’s called the Norma Jean Suite. Everywhere you look, there are nods to the famous couple, and not just in the many pictures dotted all over the place. The suite has been painted using subtle tones, mainly using pale pink, black and white to give the rooms an understated color scheme. However, there are splashes of color around which are included as a nod to Marilyn’s love for wearing bright lipstick. Over in the umbrella stand, you’ll find a baseball bat symbolizing DiMaggio’s successful career, as well as shopping bags in the wardrobe taken from Bloomingdale’s. Anyone familiar with Monroe’s personal life will know that the department store was her favorite place to shop. Not only is this suite a great place for being surrounded by Monroe and DiMaggio memorabilia, but it also offers a lot to those staying there. Large sofas and a flat-screen TV fill the living room, giving you ample opportunity to sit back and relax with one of Marilyn’s iconic movies. Over in the dining room, things are just as spacious, with enough room to seat four people. If you’re looking to go to dinner with friends, you can invite them for a meal back at the suite instead. They can even stay over too. One of the sofas also pulls out into a bed, so your party can go on well into the night. 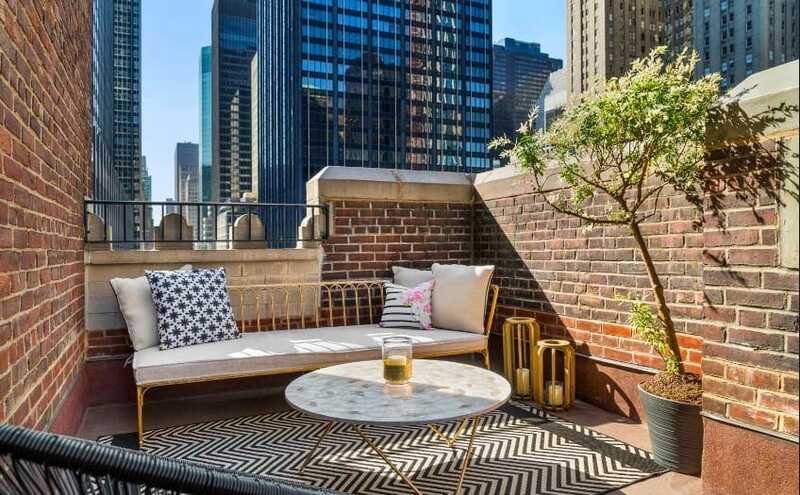 Outside, you have 200-square feet of terrace to chill on as you look across at the Manhattan skyline. There are skyscrapers as far as the eye can see, which is perfect if you’re a fan of modern architecture. As you sit out there, you can reminisce about the fact that Monroe and Dimaggio were both doing the exact same thing at one point in time. Staying in this suite definitely isn’t cheap. One night alone will set you back $1,200 which is pretty hefty if you’re planning a lengthy stay. If you have the money to spend though, it’s worth experiencing what the suite has to offer for at least one night. Even though their marriage was brief, Marilyn and Joe were an iconic couple, and getting to stay where they lived makes for a pretty unique experience. It’s hard not to be obsessed with celebrities when their lives seem so much better than ours. When you have an opportunity to follow in their footsteps in some way, you’d be a fool to pass it up.